Four leaf clovers, pots of gold, Leprechauns, and rainbows- oh my! St. Patty’s Day is just around the corner, and you can have people seeing green with envy when you make your child a creative lunch box based on the theme of the day. 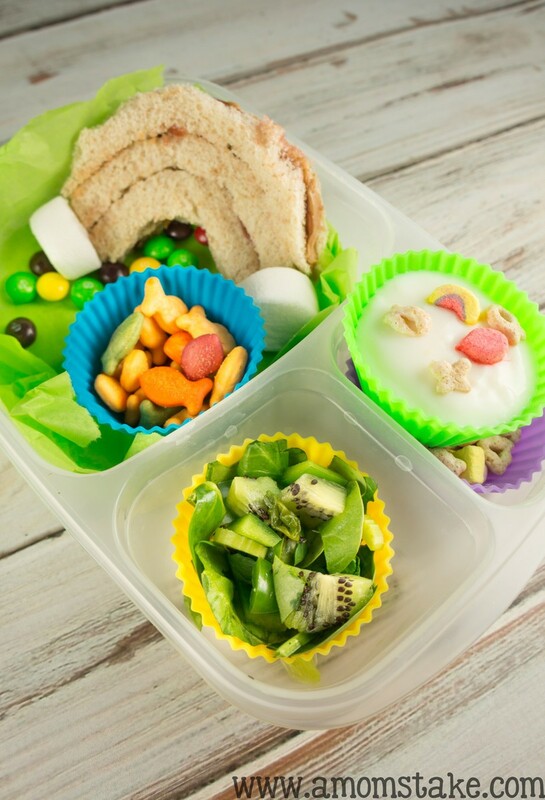 Coming up with creative lunch box ideas will make lunch time more fun for your child and let you sneak it extra fruits and veggies in fun and unique ways. Lucky Charms and Yogurt – Let’s start with dessert because it’s fun! Place six ounces of plain vanilla yogurt into a storage bowl and toss in a handful of Lucky Charms cereal on top to sweeten it. The cereal is already themed to match the day and the yogurt adds an element of health to a sweet snack. Seal up the bowl and leave in the refrigerator until time to pack the food in a lunchbox. Over the Rainbow Fun – Make your child’s favorite sandwich and cut it into the shape of a rainbow. If you want to go all out, color the stripes of the rainbow onto the bread with food coloring. With the leftover pieces of bread, cut small four-leaf clovers and die them green. Place green or yellow tissue paper in a sandwich container and then arrange the rainbow and clover pieces on it. You can end your rainbow with a single marshmallow, cut in half, to act as your clouds! Pot O’ Gold(fish) – One rally cute way to add something new to your child’s lunch for this holiday is by giving them a pot o’ gold – goldfish that is! You can buy small plastic pots at the Dollar Tree or craft stores or use silicone baking cups (I got mine on Amazon) and then fill them up with golden or rainbow colored goldfish. Green Foods – Make your child a salad using only green foods. Place spinach in the seal-able container and dice up a variety of cucumbers, kiwi, celery, or green bell pepper in the salad. Top with a sweet strawberry vinaigrette dressing and you will have a healthy side dish perfectly colored for the day. Element of Surprise – Never forget your element of surprise! 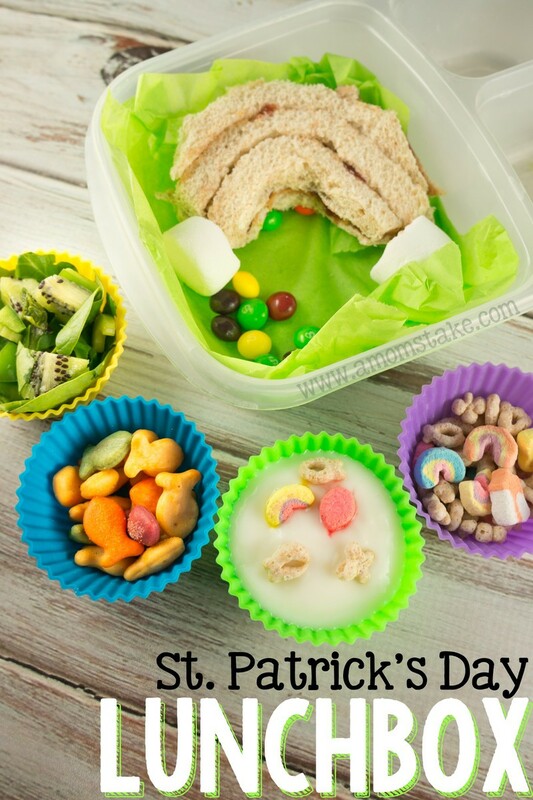 To jazz up this lunch, add in a small stuffed leprechaun or a map to find a pot o’ gold when your child comes home from school. It will keep them excited all day and shows that you put some extra thought into making their lunch extra special. 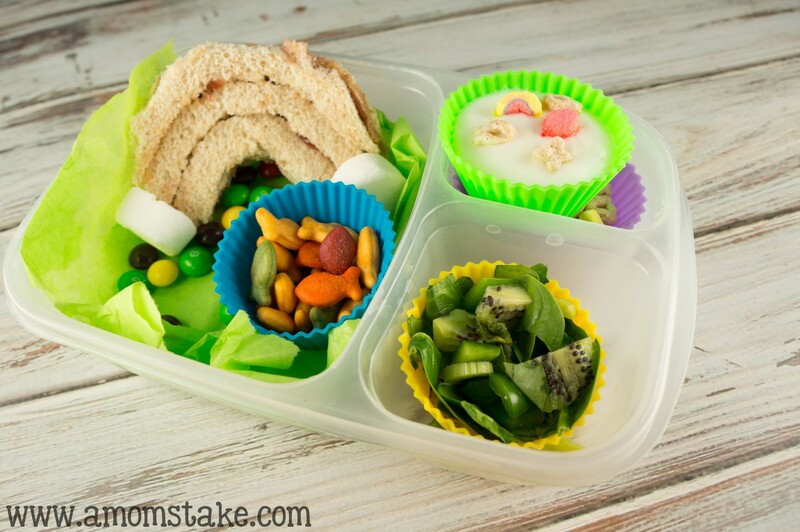 Want more creative Lunch Box idea? Come see my Creative Lunchbox Pinterest Board! Have you noticed the super cute lunch containers I’ve been using in my bento lunchbox series? They’re made by EasyLunchboxes, a company I worked with years ago back when I first started my blog. I still use and love their container set. EasyLunchboxes noticed my themed bento pins and asked if I would like to host a set of EasyLunchboxes for my readers! Of course, I said yes! EasyLunchboxes are the #1 best-selling lunchboxes on Amazon.com! You can get free shipping through the EasyLunchboxes Amazon store (USA or Canada). 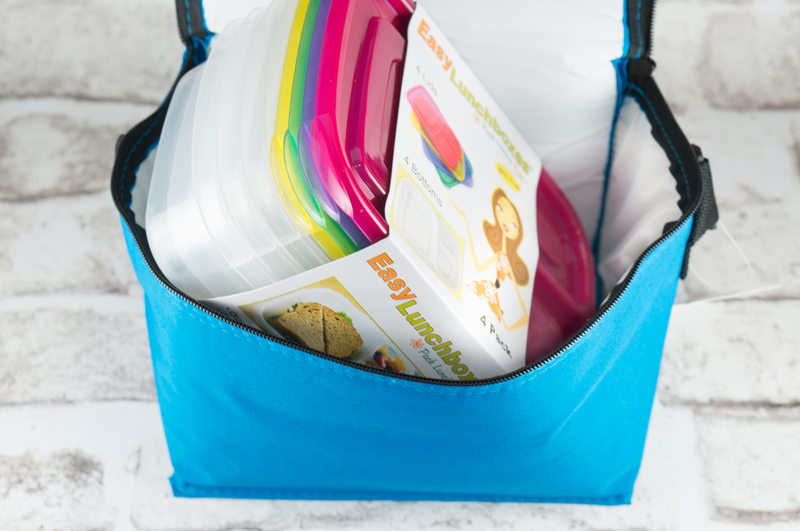 The EasyLunchboxes website also offers tons of creative lunchbox ideas and resources and you can shop directly from their site as well. What foods would you add to a St. Patty’s day lunchbox?